2. Require double entry visa to India. Bhutan is famous throughout the world for the beauty and bounty of its natural environment. Thanks to its unique history, isolated location, and conservation efforts, the country sports some of the most pristine, undisturbed wildlife areas on the planet. From bird watchers to sport fishers to tiger and leopard enthusiasts, animal lovers from across the globe flock here to encounter the country’s rare and stunning animals, as well as its abundant plant life. The Royal Manas Trek gives you the opportunity to experience all the natural beauty Bhutan has to offer in a single, unforgettable trip. This experience focuses on immersion, putting you in direct contact with all of the country’s unique flora and fauna. 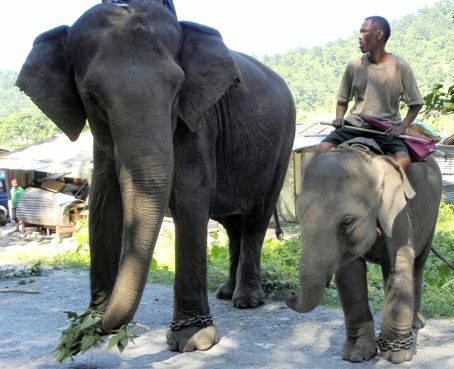 In particular, you will have a chance to see specimens like the Asian elephant, the Royal Bengal tiger, the one-horned rhinoceros, the gangetic dolphin, the Himalayan black bear, the pangolin, and the clouded leopard — all endangered species that are rare or unknown elsewhere in the world. 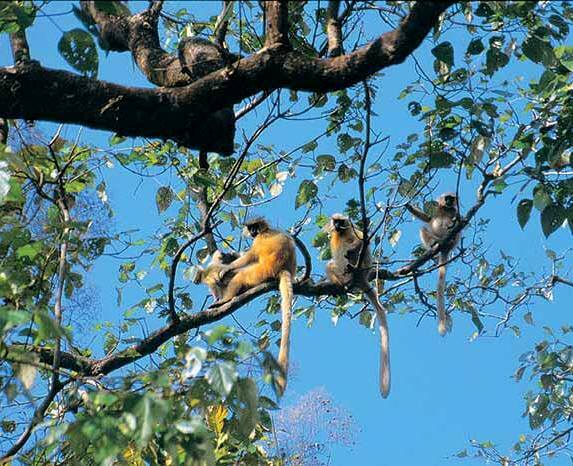 Even rarer is the golden langur, a monkey with silky blonde fur that is indigenous to this region alone. On no other trek can you find such a unique and eclectic group of animals. In addition to monkeys, bears, and leopards, the Royal Manas Trek also offers a chance to view over 365 stunning bird species. These include rare and threatened specimes like the rufous-necked hornbill, the imperial heron, the Pallas fishing eagle, the spotted wren-babbler, the emerald cuckoo, and the blue rock thrush. The park is also home to nearly a thousand different plant species, many of which have played a key role in Bhutanese religious rituals, commercial activities, cultural traditions, and medical care. Instead of flying directly into Bhutan, your trip will begin by crossing into the country overland from the Indian city of Guwahati. Our team is happy to pick you up in that town and drive you across the border, allowing you to take in the natural beauty of both countries along the way. Once we reach the Bhutan Gate, you will have to pass through the customs and immigration process, after which point we will continue onto Gelephug, a town famous for its role in trade and cultural exchange between India and Bhutan. We will take you to the Hotel Pelrithang to check into your room, and then begin a tour of Gelephug. We will end the day by sitting down to dinner and going over the details of your tour. We start the day by eating breakfast in Gelephug before getting on the road and driving north toward the district of Zhemgang. This drive is smoothest between the months of November and March, which is why we recommend that you take the tour during that time frame. We will first travel to the town of Tingtibi and then go from there to Gomphu, the site of a rustic ecological campsite located 1,450 feet above sea level. On the road between Tingtibi and Gomphu, you will have the opportunity to see a number of unique and beautiful Himalayan birds, notably including the Great Hornbill. Once we reach the site, we will set up camp at our own facilities and begin to take in the alpine beauty. Day 3 marks the first day of the trek itself, as this is where we cease to rely on our vehicles and make our journey on foot. We begin with a nourishing breakfast to build up strength and energy, and then take one of two paths on the way to Pangtang. The first path is more traditional, following a heavily forested route that takes roughly four and a half hours to walk; the second one involves trekking along a motorable road between the two locations, and only takes one hour. Our choice of paths depends on the weather as well as the size and willingness of our party. If we choose the more traditional path, we will see hundreds of unique bird species that thrive in local broadleaf forests and their undergrowth. These include wood peckers, barbets, doves, bulbuls, cuckoos, and above all, hornbills. The latter are widely considered some of the most stunning sights on this path, attracting ornithologists and other bird enthusiasts from across the globe. As we take in the beauty of these birds, we will move steadily down to a lower elevation, reaching just 239 feet above sea level. Once we get to Pangtang, we will set up camp and prepare for the next day. Today’s trek involves frequent descents and ascents, moving upward overall to an altitude of 420 meters above sea level. We will walk for roughly four hours, passing through the habitats of a broad selection of different birds, such as eagles, tree pies, bulbuls, drongos, thrushes, pheasants, and partridges, to name just a few. The final half hour of the trip involves climbing towards our eco camp at Shilingtoe. As we make this ascent, you will have a good view of the local village and surrounding area, letting you take in all the beauty of Bhutan’s natural and human geography. We begin today’s trip by hiking for three hours from our Shilingtoe campsite to a suspension bridge at Changazam. On the way, we will pass by two caves, one a famous Bhutanese religious site and the other the home of a thriving bat population. You will also get to see the Lelang twin waterfall. After we reach the bridge, we will follow a road to Panbang, from which we can see the Indian Manas Tiger Reserve. Our campsite destination, known as Anilademba, is only 160 meters above sea level and lies at the intersection of the Dangme Chhu and Mangdi Chhu rivers. 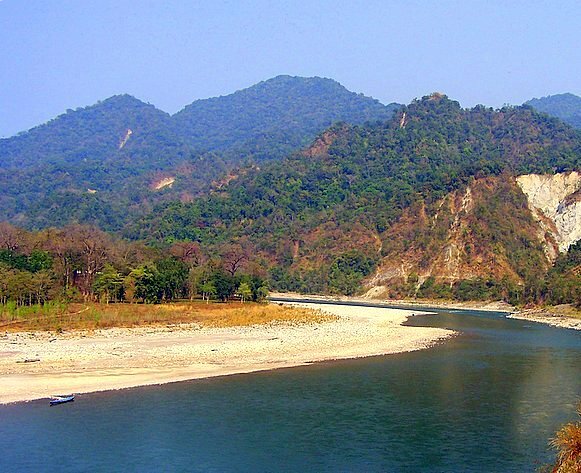 The Dangme Chhu, or Manas, river is one of the world’s least explored rivers, and is home to some of the largest Golden Mahseer fish. We offer you the chance to reel in this prized game, so long as you release it after catching it. Besides angling, we’ll take a trek through the park to see all its plant, animal, and geographical wonders, before retiring to the campsite for supper. You may also be able to go rafting on the river, if you’re willing to brave its wild waters. Who says a safari has to take place in Africa? Today’s itinerary includes a trip to the Royal Manas National Park, where you will be able to view the majestic Asian elephants as well as water buffalos, rhinoceroses, gorals, pigmy hogs, and golden langurs. Clouded leopards and Royal Bengal tigers also abound in this area. While these big cats are harder to spot, you will likely see their scats and droppings, a reminder that you are in their domain. The Royal Manas National Park is so stunning that it’s worth taking another day to explore it. Most visitors use this day of leisure to take photographs, examine local insects, or join the park’s officials on an animal tracking adventure. Today is the most physically challenging part of our trek, with a full six hours of hiking from Panbang to Nganglam through the Bhutanese region of Norbugang. Once we arrive, you can spend the remainder of the day resting while taking in the area’s beauty. This day marks the end of the tour. Our team will drive you across the Indian border to the town of Guwahati, delivering you to either your hotel or the airport, depending on your travel plans.